Christmas flew by with our kids visiting us from Ohio and California. Little Betty Boop (Boston Terrier) is here for a visit, too. She's a sweetie and it's nice having two Bostons in the house. I will blog more later on our holiday excursions to see the National tree at the White House and the Smithsonian museums on Christmas Eve. I still have to download and edit my pics first. I had a little quiet time last night while watching our new HD TV that our kids got us for Christmas. 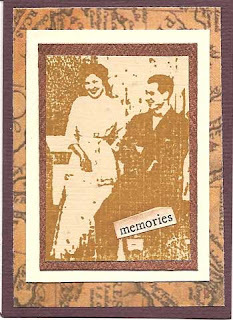 I made a few ATCs (Artist Trading Cards). I always call them Creativity Starters that jump start my creative muse. 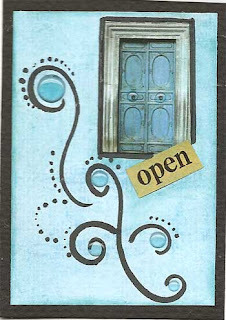 This weekend, my Art Theory Group met at The Artful Quilter in Centreville. We had a class on how to make silk fusion. Wow! So much fun and so many possibilities. 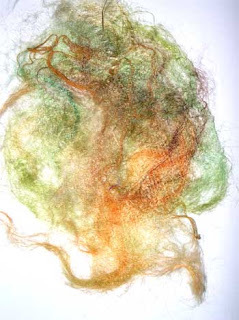 We used hand-painted silk fibers, screening, textile medium, dish soap and water. I plan to incorporate these into some art quilts. The fibers separate with the dish soap/water solution and then fuse or meld together with the textile medium so you have one solid piece. 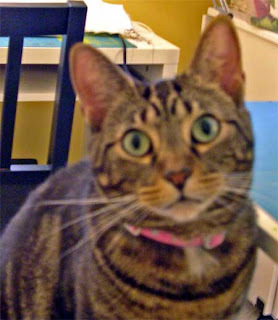 My creative muse is really wanting to work at the moment, but I have to make some drapes for the guest room and finish shopping today. Maybe if I get all my work done, I can reward myself with some play time. I've been tagged by Debi. 2. Share 7 facts about yourself: some random, some weird. 3. Tag 7 people at the end of your post and list their names (linking to them). 4. Let them know they've been tagged by leaving a comment at their blogs. 1. I use to work and teach in a quilt shop before I moved to Virginia. 2. I have moved 21 times in 34 years of marriage...mostly military moves. 4. I graduated from the same high school and grew up in the same town as former President Bill Clinton--no, I didn't know him...he was older. 5. 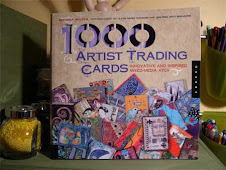 My artwork is published in 1,000 Artists' Trading Cards by Patricia Bolton. 6. 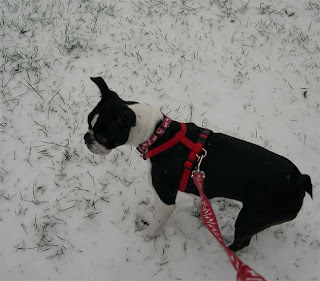 I love Boston Terriers and I have one named Emma Mariah Michelle. 7. I belong to a wonderful group of friends and we call ourselves "Quilt Monkeys". 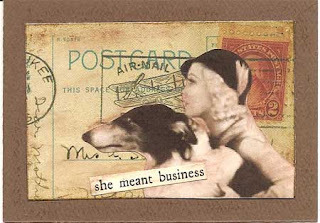 Please visit these wonderful artists blogs. 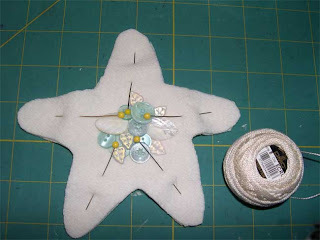 Here is a little tutorial I whipped up so you can make this star. It's so easy and so much fun to make. It's a great project to put in a zip loc bag and take with you to work on during your lunch hour or while watching TV. Just be careful to keep all the buttons and beads away from little ones and that includes family pets. 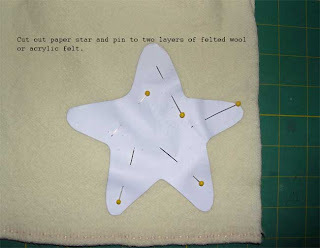 I am including the star pattern I drew, but you can easily trace any star or make your own. Please leave a comment if you like it. Enjoy! 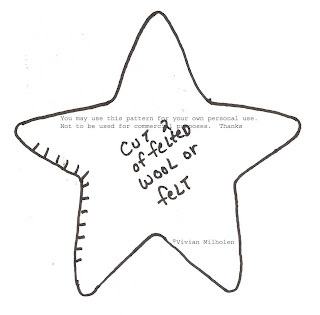 My star measures about 5 1/2"
Cut out the two layers. 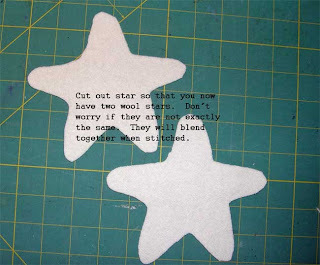 Now you have two wool stars. 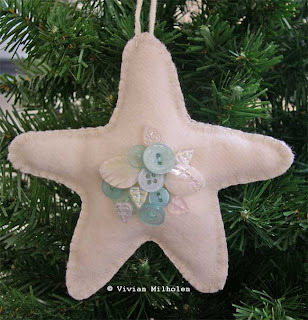 Gather various buttons (nice if you have vintage ones) and beads to "try out" in the middle of the star. When you have the ones you want, then sew them on (stitching through only the top layer). Be sure to cluster the buttons (overlap) for a more dimensional look. I decided to use these light aqua colors because they remind me of the ocean. But use whatever color you want of beads and buttons. You could even add a charm. At this point, it's all play and you can go crazy adding the bling. After stitching the bling in the middle, pin the two layers together, lining up the edges. Don't worry if the edges aren't perfect, they will sort of meld together as you stitch. Choose a color of pearle cotton size 8. I like to keep it the same color as the wool. 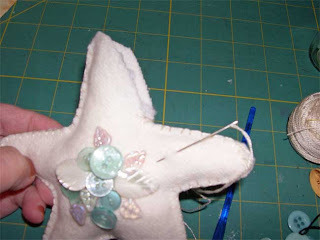 Using a buttonhole stitch, start at the top and leave room to insert a ribbon for hanging. Stitch almost to the end, removing pins as you go. 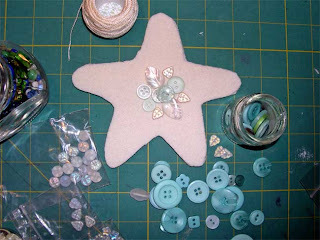 When you are almost done, lightly stuff the star with bits of batting. Don't make it too puffy! Less is more in this case. Finish stitching around the edges and insert a ribbon for hanging. Stitch the top closed. You are done! Hi! My name is Taylor and I love being a studio cat. I know you probably have seen these pictures of Taylor already, but she is just so sweet and beautiful that I had to blog about her today. She must have been a model in her past life because she loves to pose for the camera. In the first picture, she is looking at a photo of our son with his puppy. 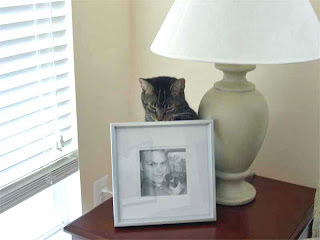 (Taylor use to belong to Matt and then we adopted her). 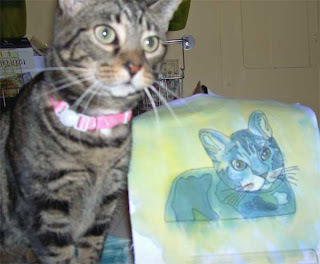 In the third picture, she is posing beside a thread painting I did of her. 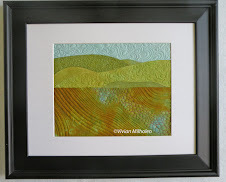 In case you haven't seen her make an art quilt, go here. 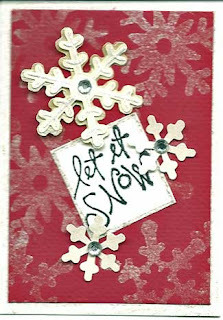 This is a new ATC that I made for the Wednesday Challenge for the Stampers Corner group at Yahoo. We were given an image to download and our challenge was to make something using the image. 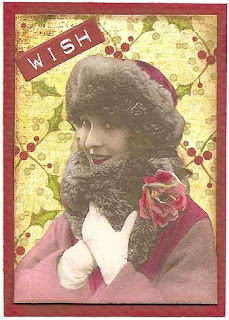 I made an ATC using Christmas card stock by Basic Grey. I used colored pencil to make her lips and the rose a bit more red like the holly berries on the paper. Every Wednesday we will have a new challenge. This is a great group if anyone wants to join...I have learned so many techniques from this group. Techniques you can also use on fabrics! Hooray!